Cathy at Rambling in the Garden is celebrating today, and I am joining her, as she has been hosting her wonderful meme ‘In a Vase on Monday’ for four years now. Congratulations on the anniversary Cathy! I thought my contribution quite original until googling both receptacles… oh well, it’s been done before, but probably not on a rainy Sunday afternoon in November!! On the left, a pineapple – slightly hollowed out with some foil inside to retain a little water. The focal points are the Heuchera leaf with its lovely red veins and the tall zebra grass. I then used the remaining annuals which are huddled up to the house in their pots, but shivering nonetheless: Nemesia, Sanvitalia, Verbena, yellow Lantana and a white Geranium (Pelargonium). Mmm, I am looking forward to snacking on some more of that pineapple later! I managed to photograph it from the dry balcony (it poured all day Sunday) with the remaining golden hazel leaves in the background, but the light conditions were not much better and it is cold… just 4°C today! (Most of the other photos were taken in the kitchen.) The cabbage was hollowed out enough for a tiny schnaps glass to fit in. I used the last of the Snapdragons, more Nemesia, and a tiny white flower sold to me as a Chrysanthemum but which from the foliage seems more like Dianthus family. Whatever it is, it is flowering like mad still, nicely sheltered under the front porch. I wonder how other Monday vase creators will have met Cathy’s challenge. It was great fun again – thank you Cathy, for motivating me to go out on such a rotten day and find some little treasures to brighten up my Monday! And here’s to year FIVE! This entry was posted in Garden, In a Vase on Monday and tagged Autumn, Cut Flowers, Garden, Seasons, Winter. Bookmark the permalink. Well, I have never seen it done before, wonderfully creative Cathy. The cabbage makes a beautiful, shiny red container. Your arrangement is so pretty, I love how you have tied them in with ivy and grapes. Thank you Chloris! The sun has come out this morning and I briefly thought I could take some better photos, but then remembered we have already eaten the cabbage and I have chopped up the pineapple too! LOL! What a terrific imagination you have Cathy – the cabbage is almost prettier than the pineapple! That little dianthus/chrysanth beastie is quite a sweetie, isn’t it? Lovely! It really is a very special IAVOM – and I just found a recipe for cabbage and apples a la Lorraine (where I live) so it’s inspired me to eat too! Absolutely stunning! You ate so creative. 🙂 Yes, glad I got that shot of the cabbage outdoors to show its true colour. Edible vases would be a nice challenge! 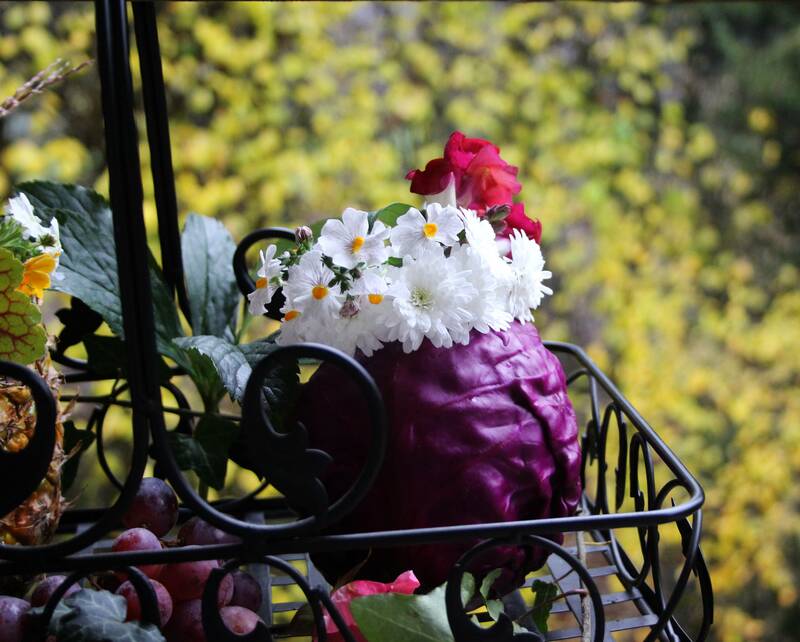 Oh my you are so creative and these vases are amazing….lots of work and boy did it pay off. You have inspired me to think way outside the box Cathy! Thank you for these wonderful vases on a cold wet Monday. Glad you liked it Donna! Have a good week! Beautiful and healthy containers this week. The deep purple of the cabbage sets off the flowers so nicely and the pineapple looks a little like a fancy tropical beverage complete with a heuchera umbrella and miscanthus straws. Well done! Our local farm stand offers a fall class of using a pumpkin as a vase. But using a cabbage is such a splendid idea! Just fabulous Cathy! I’ve seen pumpkins done before, but didn’t have one to hand and wanted to be a bit original anyway… I think there are endless possibilities for veggie vases! LOL! Great flowers, and such a clever use of fruit and veg as holders. Very clever and berry beautiful. Cathy a lot of imagination and the result …. fantastic! I love the two “vases” but the red cabbage is sensational as well as its flowers. These are arrangements and vases one hundred percent vegetarian! The pineapple is also very beautiful. I congratulate you. Greetings from Margarita. The cabbage seems to be the favourite Margarita. And yes, all vegetarian and edible! LOL! What exciting containers you employed–colorful and creative. I love the beautiful foliage of that Heuchera. The white flower does look like a chrysanthemum. Does it have a fragrance? Great fun and original, or so I thought but perhaps there is nothing new anymore. That’s a beautiful basket and you’ve found lots of lovely fillings. 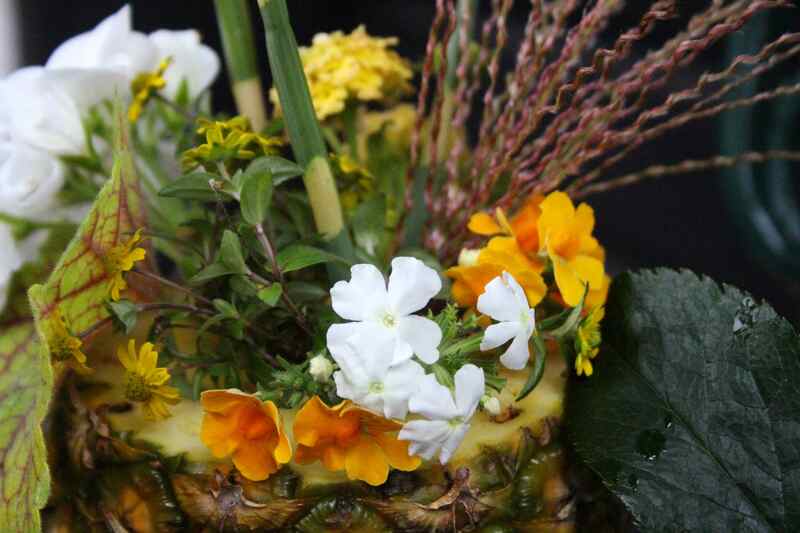 I’ve never seen either a pineapple nor a cabbage used to hold flowers so I think the selection was very clever, Cathy! You also did an excellent job accenting both. And the fact that nothing went to waste here – that’s perfect! Oh how ingenious Cathy. I’ve come across a flower filled hollowed out pumpkin before but never pineapple or cabbage either red or green. I love the concept of 100% natural vases and will be looking at fruit and veg in a new light now 🙂 Just a couple of degrees warmer than you today. Hi Anna. Since the weekend I have been looking at my vegetable box in a new light – so many possibilities! LOL! 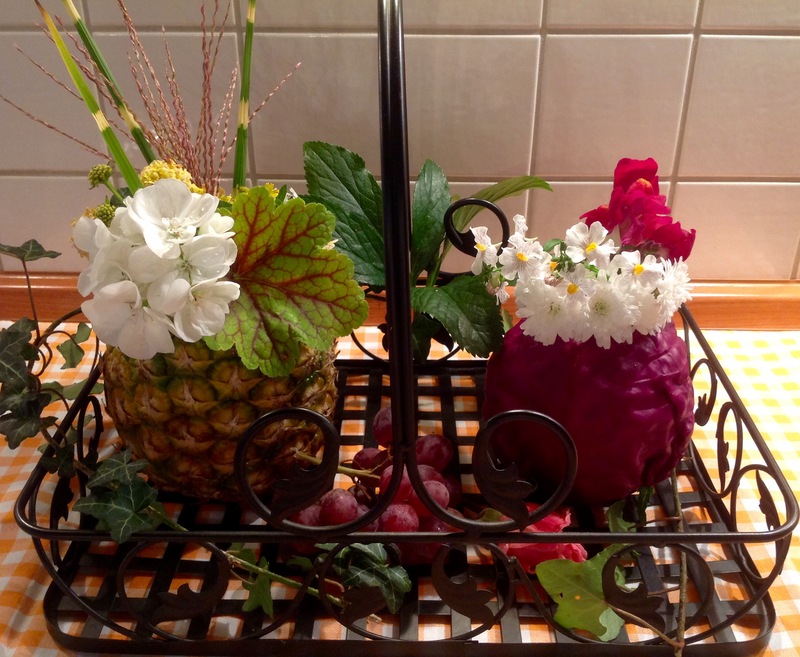 Such a good idea Cathy – I have seen pumpkins and apples used in this way but never pineapples and cabbages! It is very cold here too – I am beginning to believe that a proper winter might be on its way for the first time in 5 or 6 years. Oh, apples would look pretty too! I haven’t seen an apple filled with flowers anywhere. We have got some wintry showers coming our way at the weekend apparently… Inhioe you are wrong with your forecast! We had a hard winter last year so I am hoping for a brief cold spell in January and then spring in February! LOL! Edible vase, very creative Cathy. They both look great. Thanks Amy. The Heucheras are a lovely accent in autumn – when the other plants all die down I can see them properly again! Very gorgeous, I love the cabbage, especially the photo in front of the hazel. The white flower looks to me like an Argyranthemum, which used to be Chrysanthemum frutescens. The leaves can be greyish like a Dianthus, although not so linear. Oh thanks Cath, I think you are right about the white flower as the foliage is silvery and fern-like. I wonder if it will survive our winter! So clever, Cathy! Like flower cocktails. Really inventive and beautiful. Thanks Annette, Hope you have a good week too! Outstanding, I love the cabbage! They actually make jack o lanterns out of pineapples here! Despite your cold weather and shivering annuals you’ve amassed a glorious lot of blooms, and I do love the pineapple and lovely shiny cabbage. Zebra grass is brilliant too! It’s almost impossible to come up with something that has never been done before but you did it so well! Almost looks like you should add a little rum and a straw. I particularly like that your creative receptacles add a little sunshine! They would be perfect at a luau or summer barbecue and they are definitely cheerful. I think the purple cabbage with the white flowers is particularly stunning and as we prepare for our Thanksgiving gathering next week you’ve given me some ideas! A pumpkin would be nice, but since they’re a little hard to carve out I may go for the red cabbage! Thank you for the idea, Cathy! 🙂 And yes! Congratulations to Cathy for a 4-year successful meme! Very inventive. I did wonder about fruit (ice cream obsession see), but the cabbage is brillant. Great colour and texture and matching flowers as well! Well, I think it’s brilliant anyway, plus you can rightly claim the inspiration since you came up with the idea before seeing anyone else do it. Thank you Karen! The weather often puts me off at this time of year, but then I am always glad when I do go out and find something for a vase!